Compact, high-capacity, versatile, and priced right for your varied USB charging needs. 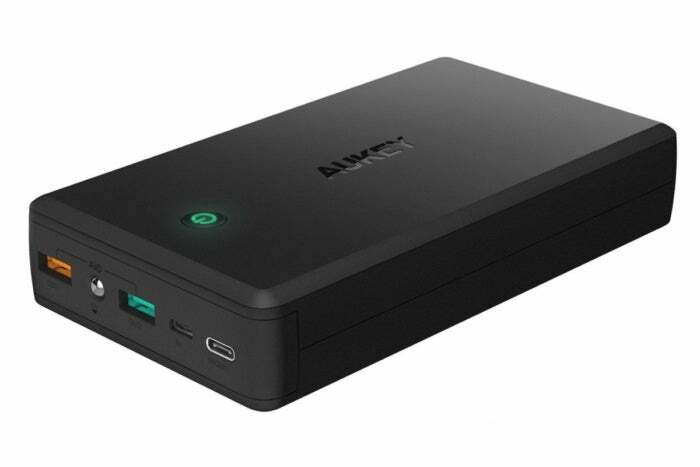 The Aukey 30000mAh Power Bank with Quick Charge 3.0 PB-T11 ($58 MSRP; $49 on Amazon) is the first very high-capacity battery with the right mix of size, weight, and features for laptop recharging. It’s only drawback is that it can’t recharge a Mac laptop unless it’s sleeping, because it lacks support for USB Power Delivery 2.0, which can pass through high wattages needed to charge a laptop while it’s in use. Packing 30,000 milliampere hours (mAh) or 111 watt-hours (Wh), the Aukey showed in testing that it could deliver the equivalent of over 1.5 full charges for a 2016 12-inch MacBook or deliver more than a full charge to the 13-inch MacBook Pro with Touch Bar. My 2015 12-inch MacBook recharged at a rate between 7Wh and 8Wh per hour, which translates to a couple of hours of low-intensity, low-brightness use per each hour of charging. Weighing in at just over a pound (20.4 ounces) and taking up volume a bit smaller than a paperback book (5.9 x 3.3 x 1.1 inches), it’s the perfect item to throw into a bag when having access to an outlet is iffy. On a long-haul flight or other situation without power for an extended period, this battery is your current best choice. The battery pack is fairly efficient, delivering in testing over 60 percent of its total potential as charge, or about 65Wh. The available energy range with other USB-C battery packs varies from 50 percent to about 85 percent, as power conversion, heat, and other factors reduce the total available charge. The battery shares the problem of all those currently on the market, in that it taps out at 15W (3A at 5V) over USB-C for both recharging itself and charging external devices. That’s a shame, because the USB-C spec allows far higher charging parameters with the right internal circuitry, cable, and power adapter. This means that the Aukey can’t recharge any model of Mac while the computer is awake. In my testing, with a 2015 12-inch MacBook with an aging battery, I wasn’t able to hit that maximum 15W charge rate, either. A battery monitoring app showed the battery delivering 15W, but the actual transfer was roughly half that speed, which can be attributable to conversion loss (between the 3.6V pack’s cells and the MacBook’s 7.55V cells) and other inefficiencies. Based on testing, the Aukey 30000mAh USB-C Power Bank can fully charge most compatible Mac laptops at least once. The battery has four ports: USB-C (maximum 3A) for input and output, Micro-USB (2.4A) for recharging only, Type-A (2.4A), and a Quick Charge 3 port with Type A, which allows between 1.5A at 12V to 6.5V at 3A with devices that support the Qualcomm standard. Many non-Apple smartphones use Quick Charge 2 or 3, as do some tablets and other rechargeable mobile hardware. The Aukey can deliver 42W across all three ports, which is almost enough to allow each port to pull maximum wattage at the same time. 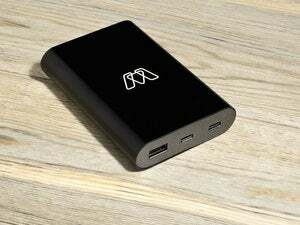 The Quick Charge 3 port gets priority, Aukey told me. But even if you had a device pulling the maximum 18W from that port, it would only reduce charging slightly on the Type-A and USB-C ports. When fully depleted, the Power Bank can take 10 to 12 hours to recharge over USB-C. (The math for 3A at 5W to recharge 30,000 mAh at 3.7W is 8 hours, except that lithium-ion batteries slow the recharging rate as batteries approach full to avoid overcharging.) The Micro-USB input-only port tops out at 2.4A at 5W, as it doesn’t support Quick Charge 2 or 3 for recharging, adding a couple of hours or more to a full recharge. If you want to know how much charge is left or how far the battery has recharged, I find Aukey’s choice of a multi-colored power light problematic. Many lower-capacity batteries feature from 4 to 10 LEDS that light up to estimate the of charge. Aukey instead opted to show 0 to 30 percent charge with a red light, 30 to 70 percent with green, and 70 to 100 percent with white. This is inadequate given the battery’s high capacity. Aukey includes an extremely short USB-C to Type-A cable for recharging via a standard USB charger. The Power Bank’s warranty lasts 18 months, or 24 months with product registration. Because this battery pack is so massive, you’ll need to be sure you’re within an airline’s rules for carry-on allowances; like all portable lithium-ion batteries, they can’t be in checked luggage. 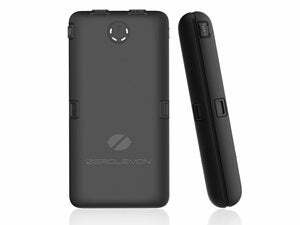 There’s no limit on lithium-ion batteries that are an integral part of a device or are locked in place, nor for portable packs of 100Wh and lower. For packs from 101 to 160Wh, the FAA imposes a limit of two per passenger, and airlines can make their own decisions about whether to allow any. The watt-hours are printed on the battery, but in such faint black-on-black type you’ll need a magnifying glass and bright light to show it to a TSA screener. There’s nothing better on the market right now at this capacity and price. If your goal is the fastest and largest possible charge for a laptop while away from power, it fits the bill. While it has only three ports for charging other devices, the choices for each are the right ones. If you need faster charger, keep watching for battery packs to enter the market with USB Power Delivery 2.0 support, which could charge a MacBook or MacBook Pro at a much faster right, including while you’re using the computer.